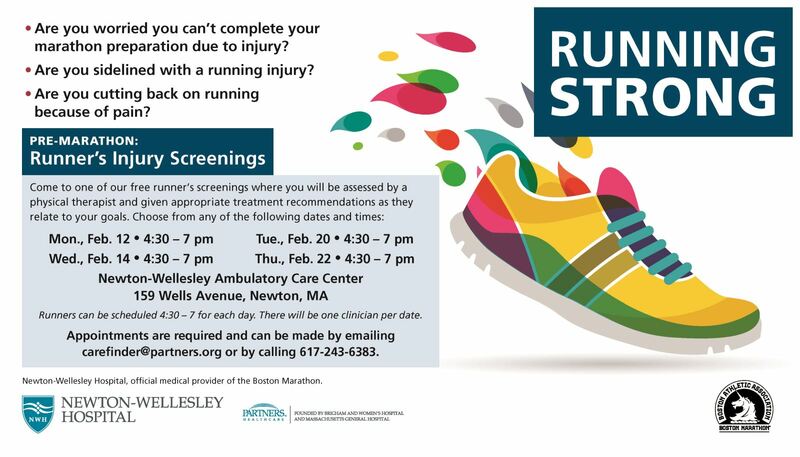 Newton-Wellesley Hospital’s Running Strong series is offered periodically throughout the year to help athletes avoid injury and maximize performance. The series includes running clinics in the fall, pre-marathon health screenings in March, post-marathon clinics in April and a summer lecture series on subjects like strengthening and nutrition. No, running form is not “something you are just born with” for most people. Sure, some gifted elite runners don’t have to work much on it and most novices are just trying to keep running. However, most serious athletes invest training time on running form. Why? Good form = running economy = using less energy = running faster. Is your stride length (distance between steps) too long? Try shortening your stride length to increase efficiency. This will also decrease the pounding and therefore the wear and tear on your body. Think about moving forward, not up and down with each step. Your cadence (or steps per minute) will increase to keep the same speed and takes some getting used to. Where do you hold your arms? It is best to keep your hands at mid trunk to lower chest level. It takes more energy to swing them low. Remember, it is all about efficiency. Do your arms move straight forward and backward? If looking at yourself from above while running, you should not notice much side-to-side motion in your hands or elbows. You should think about running close to upright (except on hills where you lean forward a bit more into the hill) with relaxed shoulders. Keep your hips forward and feel your legs pull the road under you. This takes work, but will give you a better position to distribute the ground reaction forces of running and may reduce the likelihood of injury. Are you a heel striker? A runner that first makes contact with the road at the heel of their foot is called a heel striker. Many heel strikers try to move towards a midfoot contact position. This is a difficult task, but can give you a running form that is much “lighter” on your feet. Try hitting more flat footed or towards the ball of your foot. Yes, your heel will hit the ground, but after the more forward part of your foot. This technique fits with a shorter stride length (1) and posture (4) as discussed above. Incidentally, most of the elite marathoners are midfoot strikers. Based on the rule of 10%, you could increase your total mileage from 10 to 11 safely. In the example above, there was a 20% increase! See how easy it is to overtrain? Now that may seem a little strict to some, but look at how that changes over time. Many people say "it's too slow to do it that way. I will never reach my goal." 6 16.1 rule. See, it isn't slow at all!